Valentine’s Day is a day on which lovers everywhere express their love for each other. One of the ways the man in a relationship can express his love for the woman of his life is to give her candy and flowers as tokens of his love. This day is observed in most Western countries. The Japanese also celebrate Valentine’s Day, but not without an interesting twist. It is the woman who is supposed to give her man gifts (mostly chocolates) and not the other way around. Japanese men almost always prefer Valentine chocolates bought from stores over homemade chocolates. This is due to their fear of “contamination”. There have been many instances of overzealous girls inserting their saliva or blood into their homemade chocolates. Men find this form of witchcraft or extreme obsession rather disgusting. How did they find out? Some girls downright confessed to this (right after their men ate the chocolates of course). Cuba has been a sworn enemy of the United States for decades. Over the years, United States has tried many ways to isolate Cuba hoping to topple the current regime. Most of their efforts, however, have not succeeded. One of the few success stories has been the U.S. ban on all toilet paper exports to Cuba. This has brought indescribable suffering to millions of Cubans as well as those who visit the country. Cuba is currently enduring a severe shortage of toilet paper. Foreign tourists are often advised to bring their own toilet paper when visiting the country. Not many Cubans could afford to travel outside of Cuba. For the few lucky ones, the first thing they usually do when visiting a foreign country is to purchase as many toilet rolls as possible to bring back home. Each culture has its own unique take on fashion. In the United States, people wear athletic shoes for almost every occasion. They wear athletic shoes to work, to church, and even…..to wedding. It’s not very common, but I have witnessed people wearing tennis shoes to wedding more than once. Conversely, Europeans rarely wear athletic shoes for anything other than sports and exercises. 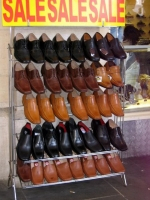 Walking on the streets of Europe with athletic shoes is considered to be distasteful. Europeans do take fashion seriously; foreign tourists should take note of this.